The cast is a dream team', wrote the Financial Times after the premiere of this production of Verdis La forza del destino at the Wiener Staatsoper. Powerful performances by Nina Stemme, who gives a fullblooded portrayal of Leonora, Alastair Miles as her father, Salvatore Licitra as Alvaro, Carlos Álvarez as Don Carlo and Nadia Krasteva as Preziosilla resulted in one of the Viennese ensembles most celebrated achievements of recent years. 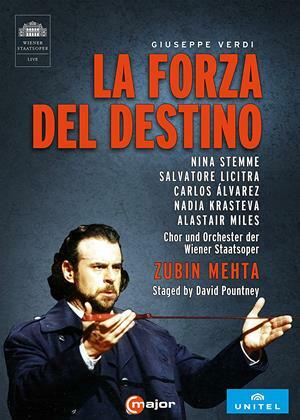 Zubin Mehta leads the Staatsoper Orchestra with agility, subtleness and relaxed mastery, and right from the start David Pountney establishes an atmosphere of entrapment by fate. 'A perfect utopia' (Süddeutsche Zeitung).